I’ll be the first to admit that there are too many zombie movies out there, especially in the short film world. I’d even go as far as to say that I’m sick of zombie flicks altogether—from their thinly veiled allegories, to their over reliance on campy gore in place of story or original ideas. Heck, I’m ready to call a moratorium on the genre altogether. Then, to my chagrin, along comes Cargo. Yes, this is a zombie film. Yes, it’s got the flesh eating undead. And, yes, there’s blood. But, regardless of the genre tropes the film hits, it’s especially notable for the new things it brings to the table. At its heart, this is a personal story—an emotional journey about a father trying to protect his young child. Gone is the tired, unnecessary exposition about how the apocalypse happened, same with high body counts and fetishistic gore. In general, my large gripe with most zombie films is that in the end, I really don’t care about much of anything—people die, but it feels empty. It’s all fun, games, and headshots. Cargo supersedes the genre by putting the drama squarely on its two central characters—a dad and the helpless child on his back. The conflict is immediate, the stakes high. More impressive, it builds an incredible amount of tension with hardly any dialogue. The result is a film that feels decidedly different—practically meditative. Accompanied by lovely, ethereal music and beautiful hand-held cinematography, it’s a film that tonally strives for something unique. By the end, I’m not ashamed to admit that I was actually fighting back tears—a response that I would never expect from any film featuring the flesh eating undead. And I suppose that’s really Cargo’s greatest accomplishment. This isn’t a zombie film. Rather, it’s a heartbreaking survival tale, more akin with The Grey than Night of the Living Dead. Australian directing duo Ben Howling and Yolanda Ramke have crafted something special here—a film that is about the triumph of human spirit amongst the unimaginably bleak. 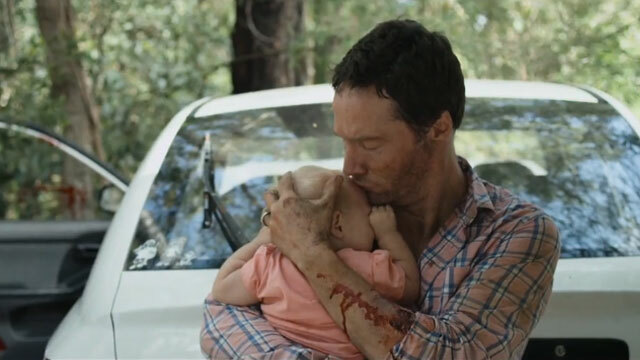 In turn, it’s not a surprise that Cargo has been shortlisted to the top 16 entries of this year’s Tropfest Competition. Heck, when the zombie flick feels fresh, you just know they’ve done something right.